As Canada’s ninth-largest urban centre, Hamilton has its share of big city traffic problems and the corresponding increases in average car insurance prices. While higher than provincial averages, Hamilton doesn’t hit the heights that some regions in the nearby Greater Toronto Area face. While pinpointing auto insurance prices that relate to all drivers isn’t possible, average motorists with clean records can expect to pay around $1,700 annually to insure their vehicles. This is higher than Ontario’s average of about $1,600 for the same driver. The table below shows Hamilton car insurance cost for a sample driver. We surveyed the car insurance prices in Hamilton for the purpose of illustrating the range in quotes based on driving record, location, and other criteria. To get a customized quote, enter your postal code above. Population and traffic density are two geographical factors that drive up overall rates in Hamilton. Individual motorists can do little about these factors. The best defense against high premiums rests on a driver’s history of both traffic offenses and insurance claims. No tickets and no claims ensure the best rates. Ontario’s car insurance system does provide opportunities for motorists to control coverage and costs. With over 100 insurance companies in the province, comparison shopping is the best way to the lowest rates. That’s where Ratelab comes in. Ratelab’s car insurance calculator searches through dozens of insurance industry partners on your behalf. You enter information once, and the Ratelab search engines match your needs to companies offering the products important to you. The best matches at the lowest price are then passed to you in the form of no-cost, no-obligation quotes. Armed with this information, you’ve got the upper hand when hunting for an insurance deal. Located at the western tip of Lake Ontario, Hamilton is the middle point of the Golden Horseshoe, a built-up commercial and industrial region stretching around the lake from Oshawa to Niagara. The city has its origins after the War of 1812 when a town site was started south of the harbour. Named after its founder, George Hamilton, the city became an industrial and manufacturing centre early in its history. Building its fortunes around steel, both Stelco and Dofasco began operations in the early 20th Century. Though Stelco has had numerous difficult times, finally going bankrupt as a U.S. Steel subsidiary in 2014, Dofasco remains the most profitable steel operation in North America, now owned by Arcelor Mittal, the largest steel maker in the world. Such is the efficiency of Dofasco’s Hamilton operation, Arcelor Mittal sold off American holdings so the U.S. government allowed it to maintain ownership of the Canadian steel producer. Hamilton is home to the quintessential Canadian coffee shop, Tim Hortons. After a failed attempt at a burger joint in North Bay, professional hockey player Tim Horton and partner Jim Charade opened the first coffee and donut shop in an old Esso station. Coffee was 10 cents and donuts 69 cents, but you only had a choice between apple fritters and dutchies. Today, with over 3,500 outlets in Canada alone and worldwide revenues over $4 billion, Tim Hortons is part of the Canadian identity. There are still about 35 Timmies stores in Hamilton itself. Hamilton is a two-level city. The lower part is just above the water level of Lake Ontario, while the upper part sits on the Niagara Escarpment. This is the same geological formation over which Niagara Falls cascades. Street names in the city often reflect where they are. 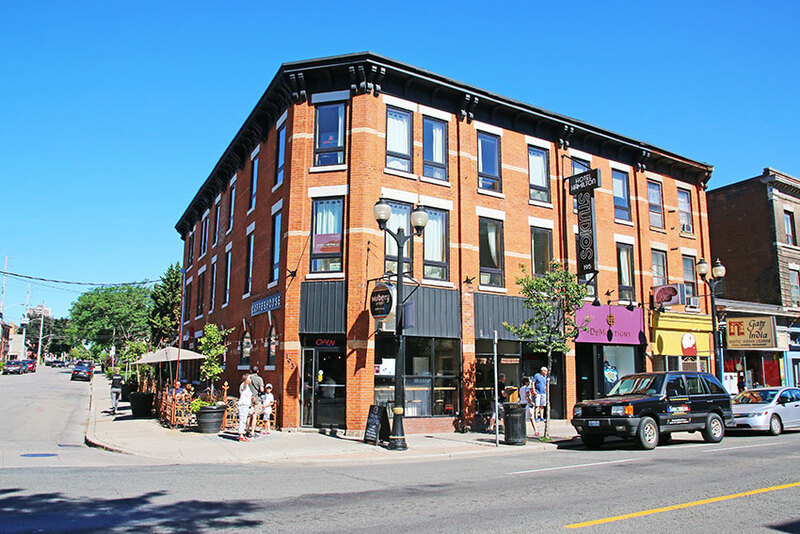 Upper and Lower James and Upper and Lower Wentworth are two examples. Niagara is hardly the only waterfall tumbling over the Escarpment. About 100 waterfalls exist within Hamilton itself, many accessible along the Bruce Trail, which winds through the city. As well as Upper and Lower divisions, city streets are broken into east/west and north/south sections. Streets crossing James St. (Highway 6) divide into east and west designations. North and south street names begin at King St. (Highway 8). Hamilton is well-served by 4-lane controlled access highways. The Queen Elizabeth Way runs along the sandbar that forms the eastern edge of Burlington Bay and the Hamilton harbour. Highway 403 runs approaches from the west and curves north over the city. 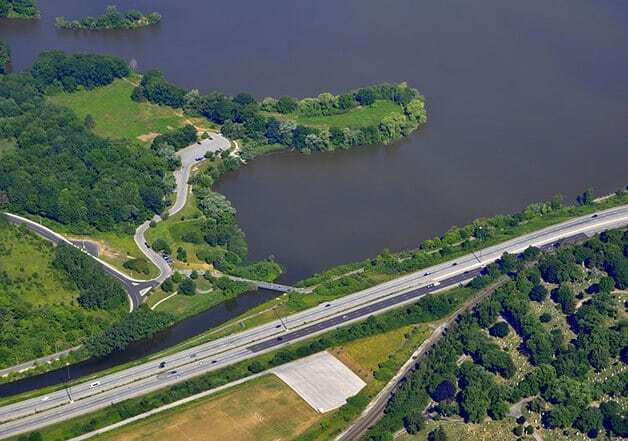 The Lincoln Alexander Parkway provides an east-west route across the city on the Escarpment and it connects with the Red Hill Valley Parkway, a north-south corridor connecting to the QEW as it turns east, south of the twin skyways over the Burlington Bay canal. The Minstry of Transportation includes traveller’s information for Hamilton and area on its web pages. A dedicated traffic report for the city lists scheduled and unscheduled maintenance and any incidents, updated every few minutes. MTO traffic cameras for the QEW near Hamilton show still images from the highway, updated every three to five minutes. The City of Hamilton maintains a road closures page that includes film projects happening in the city. Because of its diverse urban settings, Hamilton is a popular destination for television and film crews. Local radio station AM900 CHML reports traffic updates every 10 minutes “on the nines.” That is, at :09, :19, :29 and so on, around the clock. The station’s website also cycles through the MTO traffic cams in the Hamilton area. Before the completion of the Lincoln Alexander and Red Hill Valley Parkways, the only controlled access highway route around Hamilton funneled traffic from north, east and west over the Burlington skyway. Opened in 1958, the original span held a maximum of four lanes of traffic. The bridge was twinned, greatly increasing its capacity and reducing traffic constriction on the bridge. The addition of the parkways provided an alternate high-speed route to the west and south of the city. Since the doubling of the skyway, traffic on the QEW doesn’t usually slow down until turning east-west north of the lake. However, with traffic accidents or maintenance work, bumper-to-bumper conditions can occur anytime. Downtown Hamilton suffers from big city traffic tie-ups. Those unfamiliar with the downtown area should watch out for one-way streets. Avoiding traditional rush hour times is another good idea, as the narrow grid streets fill up fast. While not as spectacular as when both mills operated in their prime, the nighttime view of the steel mills from the skyway is visually impressive. Crown agency Metrolinx has plans for a rapid transit corridor on Upper James in the city. Light rail construction is already underway. Start your search now by entering your postal code in the space below. Ratelab walks you through the information necessary to identify your car insurance needs and personal risk factors. Your customized quotes follow shortly.